Once New Jersey's leading department store city, Newark traces its former pre-eminence back 13 decades to the founding of four novelty stores, and to a mercantile community which made growth over the years a reality. The first of these institutions opened in 1854 with the arrival of Hart and Dittelback on the corner of Broad and West Park streets. Ulmans and Isaacs at Broad and New streets goes back to 1857 and Klein and Thaltaemer at Broad and William streets dates to 1864. In 1859-60 Hahne's opened, described in a contemporary Newark City Directory as a notions store which sold bird cages. From these humble beginnings, Hahne's emerged as one of the state's great department stores with its flagship operation on Broad Street and branches scattered throughout the region.Indeed, Hahne and Company became a standard in fine merchandising until 1986 when the company closed during a national spate of store closings and downsizings. Another of Newark's early leading stores, L.S. Plaut, was founded in 1870 by Isaac Fox and L. Simon Plaut of Hartford, Conn.The original operation was housed in a small structure that served as both business and home for the partners. At first, the sales staff included two saleswomen, but within eight years that number grew to 25. Soon a new building, known as the Beehive, replaced the original one. When Fox retired, he was bought out by his partner, Simon Plaut, who then brought his two brothers into the business. About the same time, a stock clerk named Benjamin Altman was hired to work in the Newark firm. Years later, Altman found his way to Manhattan, where he founded one of that city's greatest stores, B. Altman's. A contemporary of Simon Plaut described his store as a sound business but thought the company's officials employed some 'crazy ideas' relating to merchandising and store operations. While these same principles generally are accepted today, they were unusual for the time. Simply put, Plaut insisted that a standard price be set for each item, that all items be individually marked with a sales price and that there should be welfare and staff organizations created for store employees. After Simon Plaut died in 1886, the store continued to be operated by his family until 1926 when it was sold to Sebastian S. Kresge, who turned it into one of his finest stores. A century ago, in 1892, Louis Bamberger, a Baltimore merchant, purchased the bankrupt Newark firm of Hill and Cragg at 147-49 Market St. with the idea of liquidating the merchandise. But Bamberger did so well with the sale, he decided to stay in business and was soon joined by Felix Fuld and Louis M. Frank. The first Bamberger advertisement appeared in 1892. By 1898 the store had clearly become a successful enterprise. 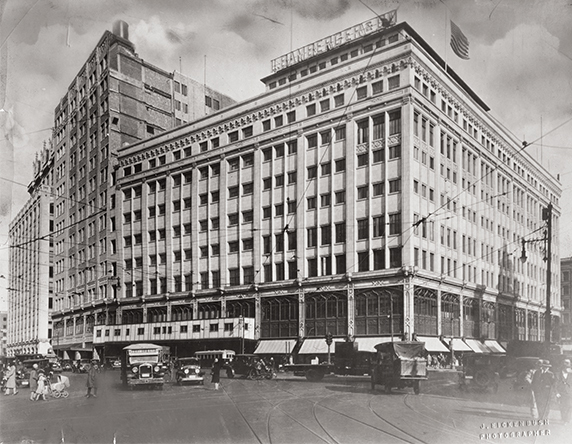 Originally, the store occupied a building later used by Orhbach's; then it moved to the west side of Halsey and Market streets with the construction of the initial part of the present building in 1923. From this site it soon acquired the reputation as 'One of America's Great Stores.' According to a newspaper article in 1935: '…Bambergers was a household word. When the need arose for anything, the name Bamberger's leaped into the mind of the person who needed it, and he straightaway became a customer who knew that he could get what he wanted and a lot of other things besides.' After 1912, the original Jarvis Hunt-designed building was enlarged twice. By 1922 the commercial palace embraced 22.7 acres, with more than a half-million of the total of 1 million square feet devoted to the store proper. More than 140 selling departments were spread over eight selling floors, tended by 3,000 employees. The store's fur vaults were capable of accommodating 25,000 pelts in its two-story steel confines. The Temple of Music on the sixth floor was dedicated to piano and Victrola sales, with the privacy of music listeners ensured by double partitions of lead glass windowed ceilings. A 'Cry Baby Room' was provided for unhappy children, sheltering serious customers. The men's department stretched over two full floors, and the Ivy Room provided lunches and afternoon teas within its deep cream and ivy-covered walls. An improved soda fountain was equipped to serve a million treats annually. A giant boiler room provided the necessary horsepower to run the store's electrical operations, and 42-ton refrigerator machines had a daily capacity of 65 tons. Eighty miles of wiring stretched throughout the complex, and 14 full-time and one chief operator handled the 15,000 daily telephone inquiries from around the state. To speed customer deliveries, 114 horsedrawn trucks, later propelled by motors, delivered an average 15,000 packages daily and 25,000 at holiday times to Bamberger's customers. There was even a brief time when Edwin F. Ballough flew parcels in his small plane from the roof of the store to customers in Morristown and the western suburbs. In 1922, WOR began broadcasting from the store's radio department. There also was an experiment with early television prior to World War II. In the same year, the famous Basement Store opened for bargain hunters. Charm Magazine was also a Bamberger's creation. This elegant magazine became one of the nation's finest department store periodicals. It not only carried news about store-related items but contained fine art work, good fiction and information about the state and region. It specialized in the operation of an elegant and efficient home. In 1929, Louis Bamberger retired after the death of his good friend, brother-in-law and business partner, Felix Fuld. Before leaving, he gathered together his store employees of 15 or more years and distributed more than $1 million to 250 fortunate old friends and employees in checks ranging from $1,000 to $20,000. While there were many reasons why Bamberger's became such a successful operation, several specific innovations led to the growth of the state's largest department store. First, the motto that 'The Customer Is Always Right,' won more friends than money lost for the store. Second, a liberal policy of allowing for refunds was almost unheard of at the time. In addition to those two popular policies, the management team of Bamberger, Fuld, and Frank was superb, to say nothing of the fact of the store's central location in the heart of downtown Newark. Macy's bought the story in 1929, but did not change the name from L. Bamberger until 1986. In August 1992, Macy's closed the state's largest store as part of a nationwide downscaling of their operations, thus ending a century of leadership in the city and state. Nevertheless, the Bamberger and Fuld names continue in the institutions which they cared about. During their long history of philanthropy, they were major supporters of the Newark Museum, the Institute for Advanced Studies at Princeton, the cherry trees of Newark's Branch Brook Park, Beth Israel Hospital, the YM-YWHA, the New Jersey Historical Society, and the Newark Public Library. Few cities or regions have benefited so generously from such a merchant prince. To complete our inventory of great stores, we have to mention Sears, Chase, Two Guys, and Klein's on the Square. All these stores were part of the Newark scene until the 1970s and 1980s, and were part of the reason why 'half the world seemed to go down to Newark to shop.' Times have changed. With the closing of Bam's on Friday, August 7, 1992, a time-honored custom slipped into history. Yet the memories will long remain pleasant ones.